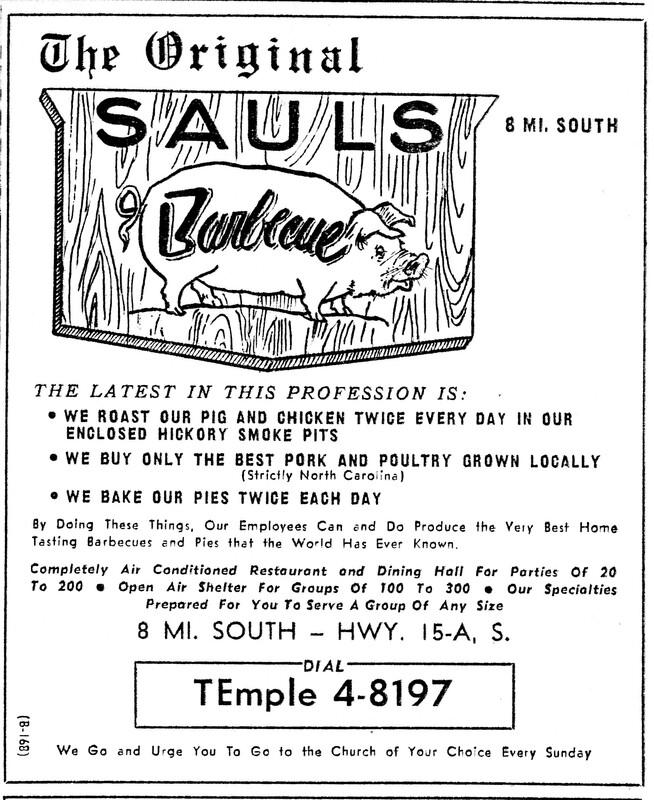 Below is an advertisement from the 1956 yellow pages for Saul’s Barbecue in Raleigh. Thanks to hog historian/swine sociologist John Shelton Reed, who sent me a photocopy of the ad, which he came across in the archives of the fabulous North Carolina Collection at UNC-Chapel Hill’s library. My favorite elements of the advertisement are its emphasis on local sourcing of ingredients (not just a 2010s selling point, it turns out) and, of course, the priceless plug at the bottom of the page. I’m not sure if the Temple of the BBQ Jew would count as an acceptable “church of my choice” but maybe. If any of you readers remember Saul’s, leave a comment, as I’d love to hear about the place. this is great…nothing really has changed since then…bbq has been around forever. out the recipe, anyone have any ideas? I think they were maybe cut into wedges, par boiled for a short period of time, cooled off, dipped in flour and ? any ideas? OMG-I was just telling someone at work about Saul’s BBQ that use to be on South Saunders St. in Raleigh and how I use to love their fries-I knew they had some sort of batter on them-they were so good!! Wish I knew if there was somewhere that still cooked them like that. Our Family use to eat at Saul’s and we just loved it. It’s been over 40 years. Is there still a Saul’s? We also use to love the Angus Barn, they had great food. I new Thad Eure and Charlie Winston, the owners. They opened a little restaurant called “Chicken Junction”not to far from Saul’s. Well, I guess if you live long enough,”Everything Will Change”.